Maine Traditions Prefinished American Cherry Flooring - Goosebay Sawmill and Lumber, Inc. Produced in Maine Traditions truly appealing Antique grade, which combines the quality and consistency of Premium grade with the color contrast and character of our Coastal grade. Maine Traditions produces an American Cherry floor with character not found anywhere else. They call this proprietary grade “Antique”. Warm and inviting, Premium grade Cherry is combined with the varying color, mineral streaks and occasional small solid knots found only in Coastal grade’s heartwood and sapwood. The result is a sophisticated, charming floor whose depth of color actually improves with age. With an unmistakable richness that’s arguably unmatched by any other domestic hardwood, Maine Traditions Antique American Cherry is an excellent upgrade to nearly any home’s flooring. 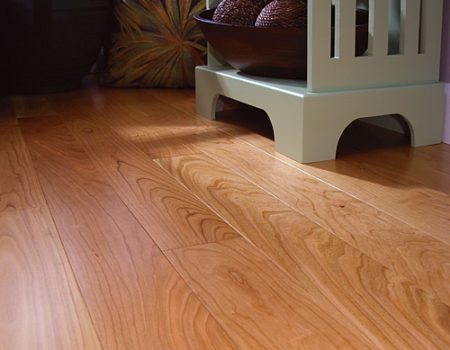 This handsome solid Cherry flooring with clear Nano-PLUSTM UV finish is available in 3 1/4″, 4″ & 5″.